In this Football Manager 2018 experiment, we have placed a 32-year-old Alex Ferguson into FM18 to see how he’ll progress. If you missed the previous post in this series, do go back and find out what made Fergie leave his first managerial role with East Stirlingshire to become Annan Athletic manager. In this post, we will review the next five years of Alex Ferguson’s career as he looks to learn from his first managerial post with East Stirlingshire. Alex Ferguson has improved upon his first season with Annan by finishing two places higher in 4th. In the Scottish League Two, the top team automatically earns promotion to the league above while the teams placed 2nd to 4th enter a playoff with the 9th place team from League One. Annan knocked out League One side Peterhead (who therefore were relegated) but lost out to Elgin City in the final to win promotion. So close for Fergie and co. This year, despite finishing 2nd in the league, Fergie’s side failed again to earn promotion through the playoffs. Peterhead sought revenge after last years playoff and won against Annan in the semi-final before losing to Berwick in the final. A much improved season for Annan as they came within three points of winning the league. But they will remain in League Two for now. Finishing 3rd in the league qualified Annan for their third consecutive playoff appearance. Once again they renewed their rivalry with Peterhead in the semi-final, winning this round 3-2. But Annan failed to beat League One side Montrose in the final. A rare poor season, in terms of league position, for Annan and Ferguson. However, you’ll see in the table shown later in the post that Annan were actually predicted to finish in 9th place and have overachieved consistently for the last few seasons. Without Annan in their way, Peterhead reached the final of the playoffs. They lost to Arbroath. Finally, in his sixth season with Annan Athletic, Alex Ferguson has won promotion. They did so comfortably in the end and won by 7 points. Peterhead finished down in 8th place and will be hoping that Annan can survive League One and finish high enough to avoid a relegation playoff. Ferguson has now managed 255 games for Annan, winning 40% of them. He’ll be hoping to improve this in time, but he’ll be focussed purely on surviving Annan’s first season in League One. You can see in the end column how Ferguson has performed when you look at his sides’ expected finished and actual finish. With East Stirlingshire Ferguson was sacked when his side were in 15th place when they were predicted to finish in 6th, hence the score of minus nine. With Annan, he has exceeded expectations in the previous five seasons and will be hoping to continue that trend into League One. Ferguson’s current ability has reached 147. This is an exceptionally high level when compared with other Scottish League Two managers. In the 2026 season here’s a list of the CA of the 2025/26 seasons’ top four managers (below Annan). Clearly Ferguson is far and away the greatest manager at this level. So why hasn’t he been picked up by a higher club in the last five seasons? It could have something to do with his reputation. 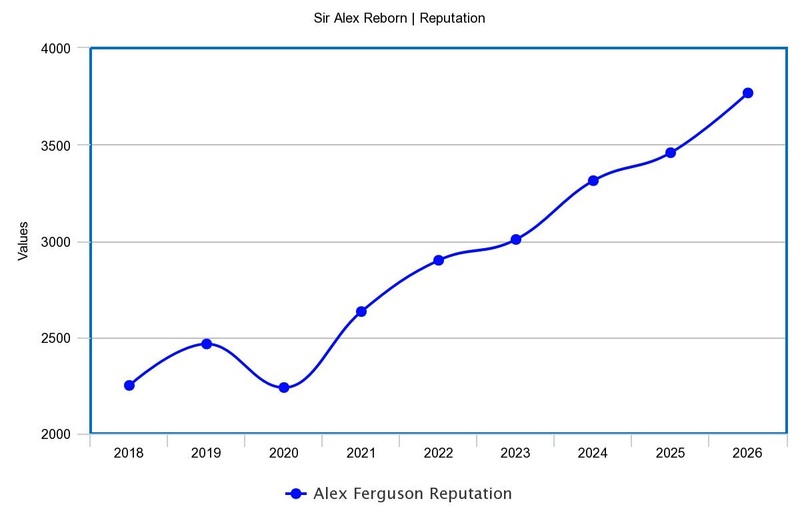 Here is a graph that shows Ferguson’s current reputation as it develops over his first 9 seasons as a manager. Let’s compare his reputation with that of the four managers highlighted above. Though far superior to his counterparts with regard to his current ability, Ferguson’s reputation is largely similar to that of his fellow managers. He received a boost to his rep after the latest league winning season, but this surely contributes to a lack of interest in Ferguson. If you liked this post, please do leave your feedback in the comments! 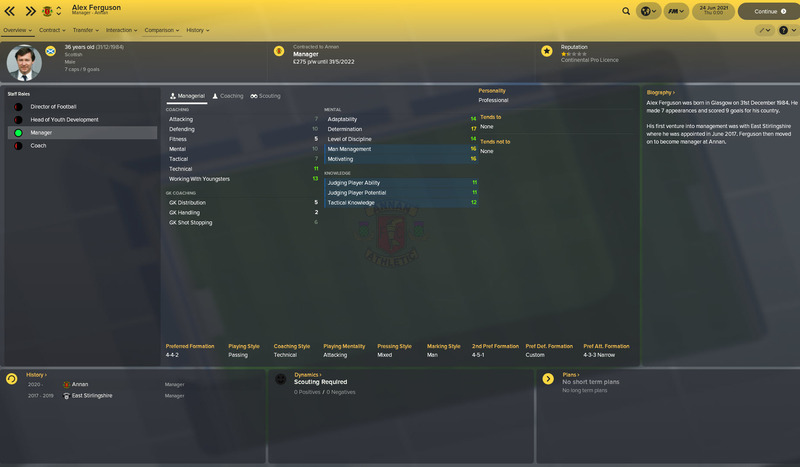 After 6 seasons with Annan Athletic, Ferguson has finally earned a promotion. But how will his side fare in a higher division? Will Fergie remain loyal to Annan or get poached by a bigger club? Leave your predictions in the comments! 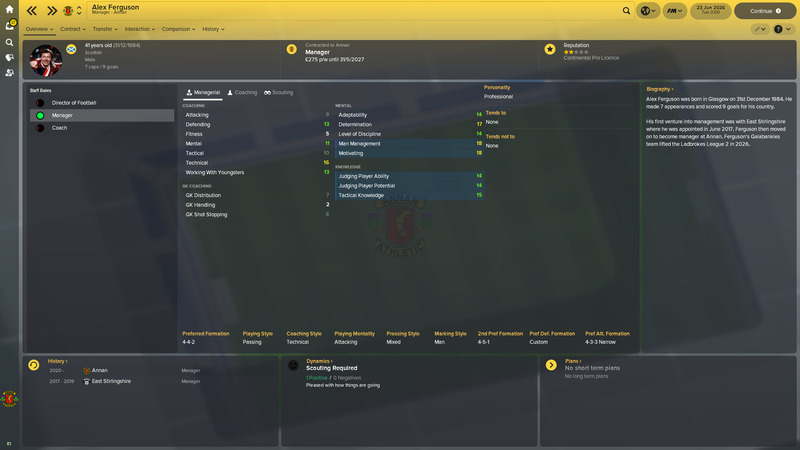 This entry was posted in FM Experiments | Sir Alex Reborn, FM18 Guides, Experiments & Wonderkids, Football Manager 2018 and tagged alex ferguson, annan athletic, FM Experiments, fm18, football manager, scotland, scottish league two. Bookmark the permalink.